Located between the Allgäu Alps and the Tannheim mountains at an altitude of 1,072 m, Guthof Lutz in Tannheim Valley is an ideal starting point for road bike riders. ‘Europe’s most beautiful high valley’ has 22 varied bicycle tours and 2,500 km of cycle paths and roads to explore, in Tirol as well as in Allgäu. 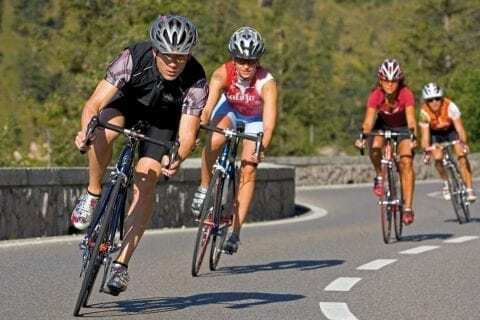 One of the regular sports highlights in Tannheim Valley is the annual cycling marathon. Having lockable bicycle, laundry and drying rooms, info packages with suggestions for bicycle tours and elevation profiles, and being perfectly situated, Guthof Lutz has everything road bikers need for a successful cycling holiday. In the evening, cyclists will enjoy relaxing in our spa area with our extremely popular heated infrared loungers. On top of that, there are infrared panels in each bathroom. Never has Tannheim Valley shown any mercy for cyclists’ calf muscles. 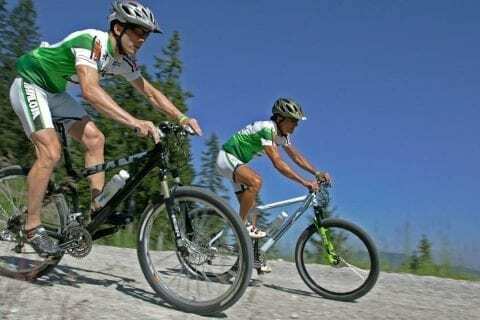 The ‘Bike Trail Tirol’ with its 800 km of combinable routes is a real jewel for mountain bike enthusiasts. And that’s not even all, there are another 11 routes (spanning another 150 km) just waiting to be explored. At an altitude of 1,072 m, the Guthof Lutz holiday apartments are perfectly situated for you to enjoy the full mountain potential of the Tannheim Valley. If you want to get to know the surroundings, follow the cycling track ‘Radwanderweg Tannheimer Tal’ – it will take you to the most scenic spots in ‘Europe’s most beautiful high valley’. Away from the busy federal roads on well signposted paths, you can enjoy nature to the fullest. Or why not hit the road at Guthof Lutz holiday apartments and head towards Rehbach and continue to Ober- and Unterjoch in Allgäu. There’s no better way to cool off than to take a dip in our marsh pond ‘Floschen’ along the trail. A tour in the direction of Tannheim via Grän to Haldensee lake promenade and on to Nässelwängle provides for variety. Don’t miss taking a detour to the nature reserve Vilsalpsee, a place that is sure to make you feel at one with nature. In the evening, in our spa area with penthouse feel you can relax while enjoying spectacular views of the mountains.